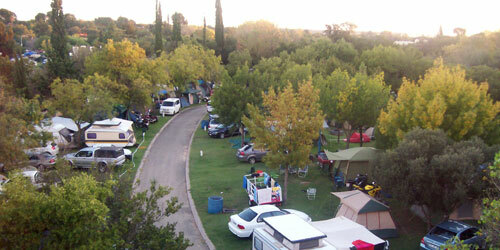 Kroonpark Holiday Resort is situated on the banks of the Vals Rivier in Kroonstad in the Free State Province, between Johannesburg and Bloemfontein. The resort self-catering accommodation comprises of two bed, four bed, and six bed self-catering chalets, with eight private caravan accommodation stands with electricity and 150 normal caravan accommodation stands with electricity with ablution facilities. Kroonpark also has one of the largest indoor heated swimming pools around. The resort has a 150 capacity convention centre with five venue rooms for smaller conferences, and a fully equipped restaurant that can cater for year-end functions or any other formal or informal functions. Kroonpark also boasts a 4000 to 5000 capacity amphitheatre that can host any type of event such as music festivals, concerts and rallies.